Universal author's strategy, allows to determine the entry points for Buy and Sell both in the direction of the trend, on the reversals of trends and in the flat market. The indicator is equipped with a unique scanner which each tick analyzes the price chart, calculates optimal levels and patterns for finding entry points by one of the 3 strategies. Each of the strategies combines author formulas and algorithms, for optimal trading we recommend using 3 strategies simultaneously as they are complementary. The advantage of the indicator Smart Day Strategy is the presence of an information panel in which the user can see the current information on potential entry points simultaneously on all trading instruments on which the indicator is installed. Also in the information panel are buttons with which the user can quickly turn on or off the signals for the three strategies and the button for visualizing the scanners of the indicator. For maximum convenience of the user in the indicator, built-in signals with pending orders Buy stop/Sell stop, Buy limit/Sell limit. For each indicator signal, the user can activate the receipt of information alerts and push notifications. After the entry point is fully formed, the pending order is converted into an order at the market price of Buy/Sell, the levels of the recommended Take Profit and Stop Loss are displayed for each order. In the event that after the appearance of the pending order the entry point has not been formed, the user will receive a notification that the order must be deleted. Smart Day Strategy is a multicurrency indicator, suitable for working with any brokers. The recommended trading period from M5 to H1. Use Strategy 1 - use strategy # 1. Use Strategy 2 - use strategy # 2. Use Strategy 3 - use strategy # 3. Auto levels (On/Off) - Calculate the levels of the setting Take Profit, Stop Loss automatically for each time frame. Index Tp1 (Auto levels On) - the author's index for calculating the level of Take Profit 1. 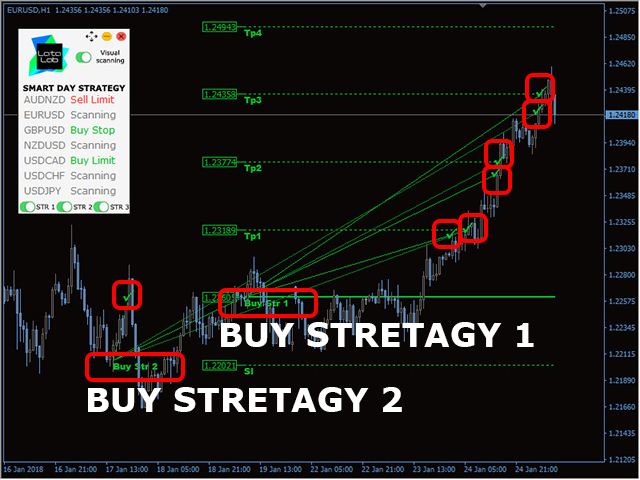 Index Tp2 (Auto levels On) - the author's index for calculating the level of Take Profit 1. Index Tp3 (Auto levels On) - the author's index of calculation of level Take Profit 1. 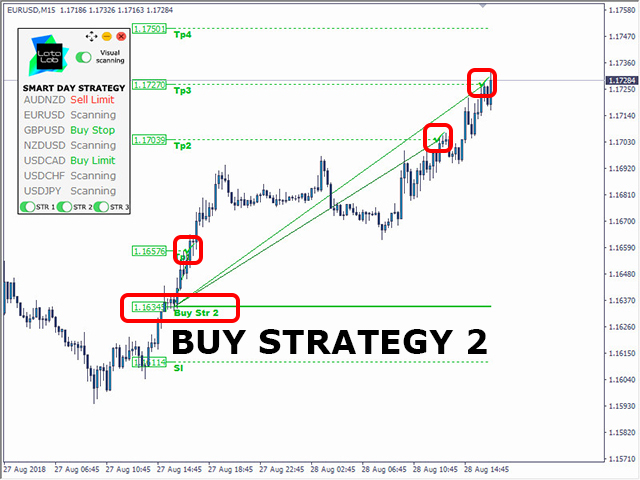 Index Tp4 (Auto levels On) - the author's index of calculation of level Take Profit 1. Index Sl (Auto levels On) - the author's index of calculation of the Stop Loss level. 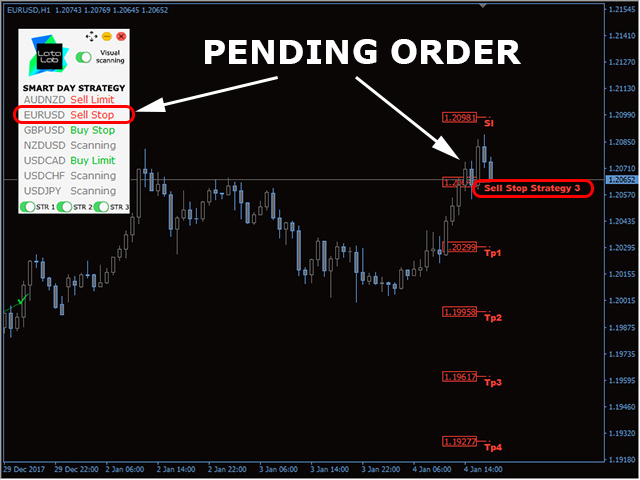 Tp1 points (Auto levels Off) - manual setting of the Take Profit 1. 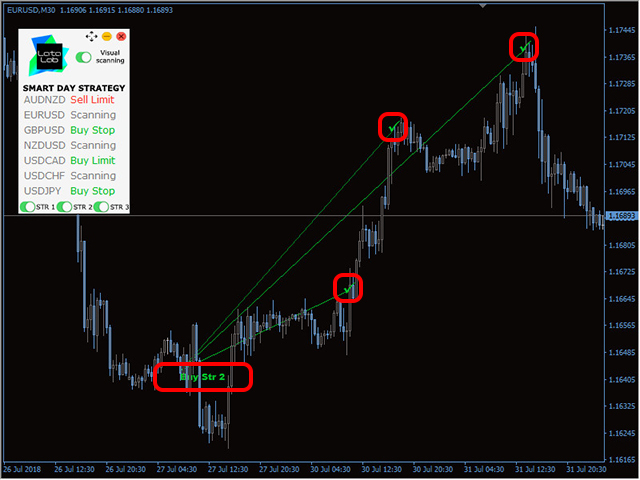 Tp2 points (Auto levels Off) - manual setting of the Take Profit 2. 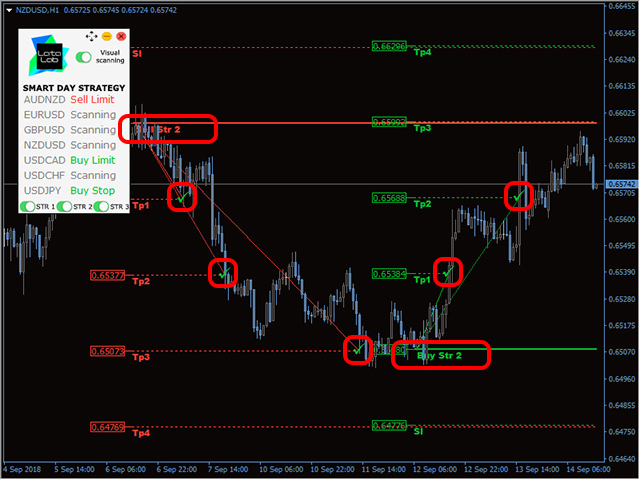 Tp3 points (Auto levels Off) - manual setting of the Take Profit 3. 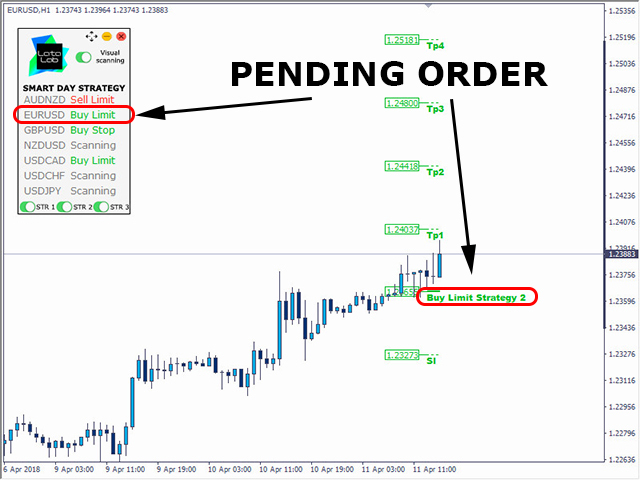 Tp4 points (Auto levels Off) - manual setting of the Take Profit 4. 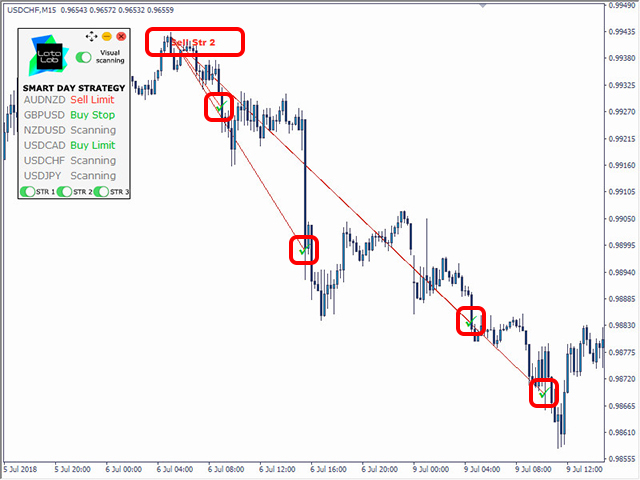 Sl points (Auto levels Off) - Manual setting of the Stop Loss level. Visualization - the visualization settings of the indicator. Show table - to display the information panel. Visual scanning - to display on the graph a visual scan (in the strategy tester does not work). 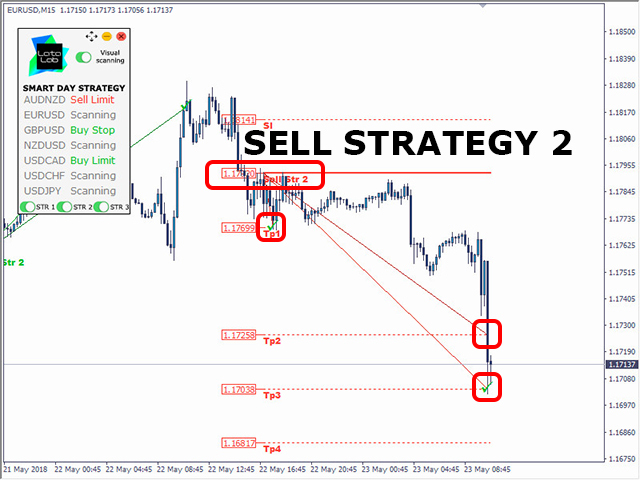 Show closing lines - display the price reach line of the levels Tp1, Tp2, Tp3, Tp4, Sl. Indicator Colors - the color settings of the indicator. Graphic theme - the color of the graphic theme. Color for general scanning - the color of the global scanner. Color for local scanning - the color of the local scanner. Color for aim - the color of the sight for the scanner. Sound only - only sound. Very good indicator, easy to use and accurate!